“While I welcome the launch this week of some Metrobus routes, I’m extremely concerned that the Ashton to Hengrove link seems to have fallen by the wayside. I immediately contacted Metrobus following their announcement, but as yet have received no meaningful response. 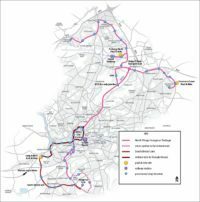 I have asked Bristol City Council to reinstate the link to the route map, and will be writing to the West of England Combined Authority to ask for confirmation that any support needed to ensure the route is launched as promised is delivered promptly. This crucial route, designed to properly connect communities currently poorly served by public transport links, was a central part of the Metrobus offer – indeed, it still features prominently on their promotional website. The Metrobus link is also essential to the success of South Bristol Community Hospital. bringing patients and staff to and from the hospital, while also servicing customers using other facilities nearby. Local residents have lived with significant disruption and inconvenience while the road that the Metrobus is to use was built. But it would seem that once again, people in this part of South Bristol have been pushed down the pecking order when it comes to community investment.